CMS Open Real Estate is a multi functional ready-to-use solution for creation real estate websites. Our system lets you create different types of websites according to the tasks and services of a project. In the first part of an article we will tell you about the most high-demand features of Open Real Estate for an individual broker. Basic SEO-settings are the basis of any website promotion.In Open Real Estate versions we involved a lot of useful SEO-functions. Site map (file Sitemap) involves information for search engines and it is taken intoaccount when the site is indextied by robots.At the same time when you place a Sitemap file on your website, you inform a search engine which pages should be indextied, how often the information on the page is updated and the level of priority of the content. In module Open Real Estate 'Site map' here can be two versions of a map: xml and html. For the users' convenience there is html-version, where it is easy to find any article without surfing the website for a long time. Easy to read and not too long URL is one more aspect of search engines loyality to your resource. In a section 'Edit Friendly Urls and SEO' you can set a clear link for an article or real estate object. For each page of a website you should use a title, description and key words. Title 'title' is shown in the tab name of a browser in search results cnippet. It is advisable for meta tags to be unique and what is more relevant. Text 'description' should be brief and relevant. Usually title shouldn't exceed 50-80 signs, and there's no point writing the description longer than 150-200 signs. It's ot a strict restriction of search engines but a long description will be just cut in search results. You can fill in meta tags for each page and Open Real Estate obect if you have module 'SEO'. Publications in social networks is a necessary aspect of a website promotion. Module 'Posting of listings to social networks' will solve the problems with community management in Vkontakte or Twitter. When you add a new listing you don't have to dupolicate the content as new posts with listings are created automatically. Technical details: a standatd VK .com post consists of a title and a short description. Almost 80% of people are visual learners, it means that they percept the information visually, that is why you should take the website design seriously. The main point in PSD and HTML layout is that you should think through all the details carefully. There are several reasons why. According to the research of Carleton university in Canada first impressions about a website are formed in 50 milliseconds.Just imagine in one twentieth of a second a user makes up their mind whether to stay in or leave your website! It means that the first reaction on the website is an emotional one and is made on the basis of non-verbal signs. Friendly interface, easy text perception, accents made in right places on a page and colour harmony will help to leave a nice first impression about your website! On the contrary, illegible texts, constantly appearing advertisement banners, psychedelic colours will annoy users and potential clients won't have a desire to stay long in such a website. If you recognised your website in the description of design lapses – fix it at once! In addition a couple of words about a layout: the website should be shown accurately in all the browsers! Broken blocks, stuck together elements, which prevent a user from perceiving the information have never helped a company to look appealing for the customers. Also take into account users of different devices and optimize your website to be used in smartphones and tablets, as the number of mobile traffic is increasing year by year. 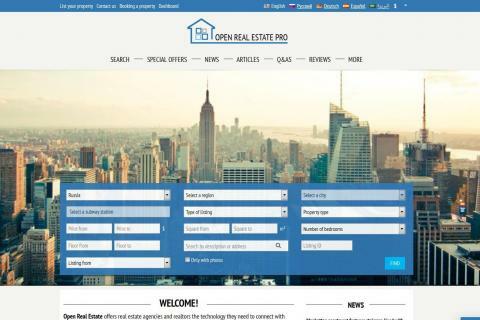 Theme 'Atlas' s made especially for CMS Open Real Estate and was tested by a lot of users. It will be convenient to view you real estate website via mobile devices due to the responsive layout. We suggest you looking through our demo version and testing all Open Real Estate features yourself in the administration panel.